Ten years ago I fell in love with Gundam SEED. In the past week, I re-watched it for the 5th time and I am still in love it. But when it comes it’s sequel, Gundam SEED Destiny, I feel kinda iffy about it. I don’t remember the details of the story all too well, but what I do remember clearly is the fact that I hated it. I hated it so much that I gave it a rating of 6 on MyAnimeList, which is a score I tend to give shows that I want to love but I just can’t. Of course I remember exactly why I hated it: 1. teared apart AsuCaga 2. Shinn is annoying 3. Kira and Lacus wut? I don’t think I ever re-watched Destiny after the first time finishing it. So the moment I finished re-watching SEED, I thought to myself, maybe this time around I’ll give Destiny another go. I can tell you now that I do not regret that decision. I revisited Destiny with the goal of trying to see Shinn in a new light. On top of seeing Shinn in a new light, I was able to see all the other characters in a new light as well. I come to appreciate what the director did with the characters in Destiny. While re-watching Destiny, I remembered the real reason I hated it. It wasn’t Shinn, it was Athrun. Athrun is hands down my most favorite Anime character of all time (for god who knows what reason) and I felt as if Destiny ruined him. I just had my quarterly review with my supervisor at work and she asked me, “how do you see yourself 5 years from now”. I answered frankly, “I don’t know what I want to do, but all I know is that I want to be at a better place than where I am now”. I know what I want but I don’t know how to get it. Which is funny because Athrun came to mind. Unlike Kira & Lacus who knew exactly what they want and how they’ll proceed, Athrun was lost throughout Destiny. He told Kira how he’s been searching for an answer but he still can’t find one which, little did I realize, was the fundamental reason for everything Athrun decided to do in Destiny. I don’t know why I couldn’t understand that when I was 15. He made all the wrong decisions but I’m okay with it now. He was only 18. Heck I’m 25 and I still don’t know what I want to do. I fell in love Lacus Clyne this time around. At first I didn’t care for her much, I guess it’s because she seemed overly perfect it felt artificial. Now I see through that. She just doesn’t express as obviously as Cagalli does. Also, the little moments between her and Kira is really cute. The two of them make a great couple. I was also able to make amends with the fact that Athrun and Cagalli were not together at the end of Destiny. The moment Athrun said 「いいんだ、今はこれで。焦らなくていい、夢は同じだ。」I got so upset the first time. 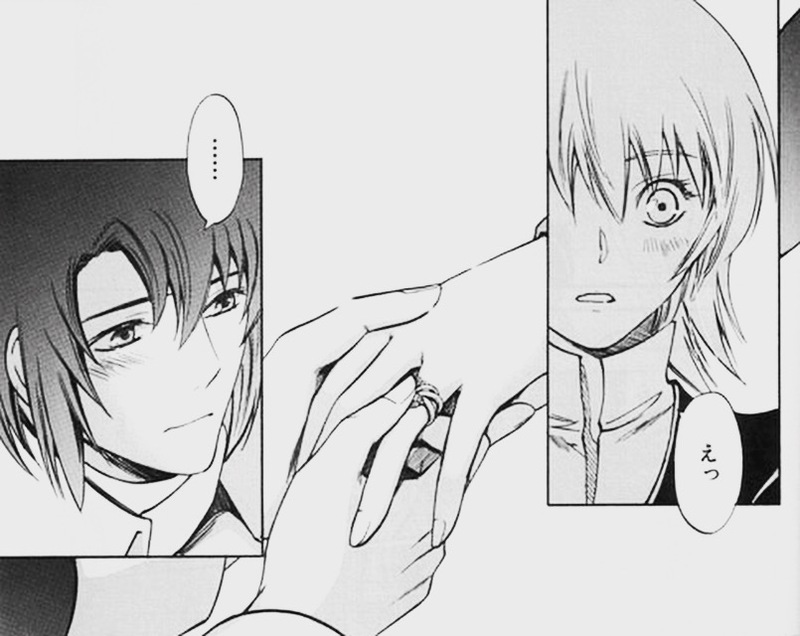 I felt as if Athrun gave up on Cagalli or like.. they completely fell apart. Now, I think the both of them made the right decision to put their romantic relationship aside to focus on more important things: Cagalli running Orb and Athrun obtaining trust, status and power within Orb. That way he can be an influential figure under his own name. Otherwise, if he were to shadow Cagalli around like he did at the beginning of the season, the most he could do would be through Cagalli. At the end of the day, what difference would that make? Plus, even though they aren’t together it doesn’t mean they don’t love each other. It’s definitely a more mature/realistic approach of their relationship, I like it. I think Athrun regained his cool after all that. Even though it still seems like he hasn’t found a clear answer, I think it’s okay. Athrun is not perfect but I still love him. I can finally die in peace knowing that the sequel of my most favorite anime of all time was not bad like I remembered to be.